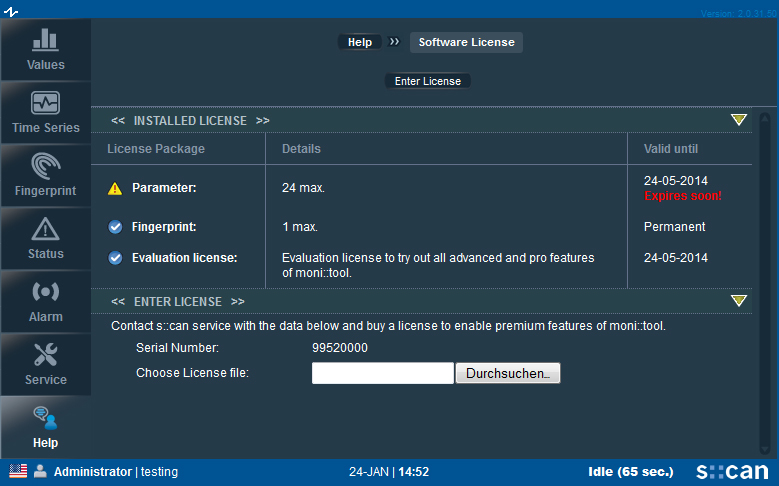 What is the moni::tool evaluation license? With every moni::tool license (also if you just purchased the basic version) you get all moni::tool functions for a 120 days trial period. The evaluation license gives you the opportunity to try out all advanced and pro features of moni::tool. After 120 days only the originally purchased functions are still available and the maximum number of parameters also drops to what you have paid for. Push „Remind me later“ to avoid to seeing this message for one day. In the case above only the basic moni::tool license was purchased and therefore only 4 parameters and no advanced or pro features will available after 24-05-2014.